HI, HELLO, HOW ARE YOU? I have something very important to say… I made Guilt Free Homemade Twix Candy Bars and they are REVOLUTIONARY, LIFE-CHANGING, and SERIOUSLY DAMN DELICIOUS! Thanks to Immaculate Baking Co. for sponsoring this post, and thank YOU for supporting the brands that keep Desserts With Benefits going! All opinions are mine and mine alone. If you ever find yourself craving a Twix® — you know, those candy bars with a crunchy biscuit base and gooey caramel filling, all enrobed in a thick layer of chocolate? 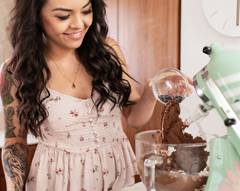 Yeahhhh, me too — but don’t want all the refined sugar, artificial flavorings, and preservatives… make ’em yourself! 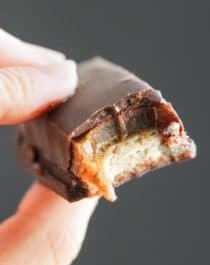 These Guilt Free Homemade Twix Candy Bars taste just like the storebought kind, sans the nasty ingredients. Oh, and they’re secretly dairy free and vegan too, shhhh! These guilt free homemade Twix candy bars taste just like the original, except these are all natural, vegan, dairy free, and reduced sugar. One bite and you'll think you're eating something full of sugar, fat, and calories, but you're not! Press the crescent roll dough into an unlined, ungreased 8x8" brownie pan. Bake for ~12 minutes, or until surface is just slightly golden brown. DO NOT OVERBAKE! Let cool in the pan. Let the mixture come to a boil again. When it reaches 266 degrees Fahrenheit, remove from the heat and whisk in the vanilla extract. Pour over the baked crust and let cool for ~3 hours, then place in the refrigerator to cool and firm up completely. Grease an offset spatula and run it along the edges of the brownie pan to separate the caramel+biscuit layer from the pan, then use pie servers or a pancake turner to transfer the entire block onto a cutting board. With a greased knife, slice the block into 18 bars (I sliced the block 3 x 6 to get 18). Refrigerate for 1 hour and prepare the Chocolate Coating while the bars chill. Line a large baking sheet with parchment paper and place it in the fridge so that it's cold. When the Chocolate Coating has the consistency of melted dark chocolate, dip the Twix one at a time, and transfer onto the chilled baking sheet. When all the Twix have been coated, refrigerate until the chocolate is completely firm. Serve and enjoy! **There will be some chocolate leftover. Feel free to chill the Twix and re-coat with a second layer of chocolate! 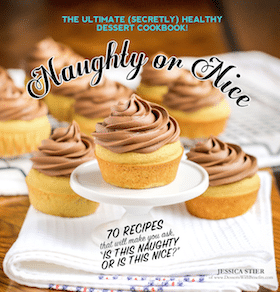 Caramel adapted from the Soft Caramels in my Naughty or Nice Cookbook! I was looking at the ingredient list of Twix® bars and, honestly, it’s pretty shocking (and not in a good way). Sugar is listed FOUR times, they contain the preservative, PGPR, and they’re made with bleached white flour and artificial flavorings. But not here. 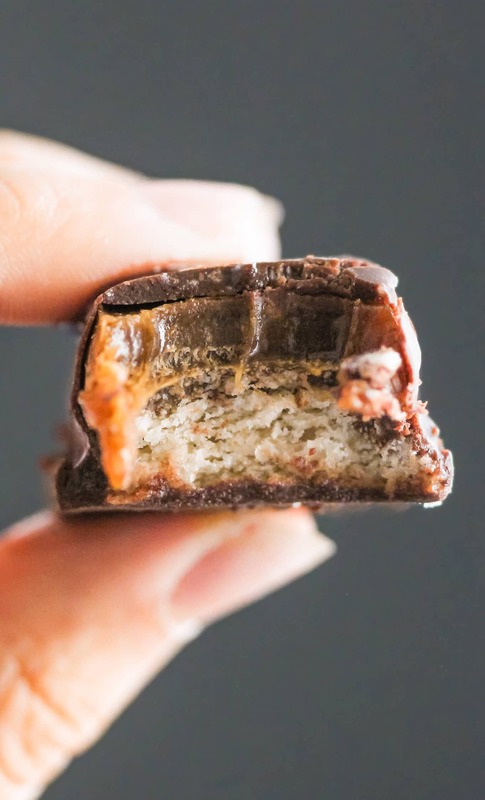 Not these Guilt Free Homemade Twix Candy Bars! I started these off with Immaculate Baking Co.’s Organic Crescent Rolls as that classic Twix® crunchy biscuit base. 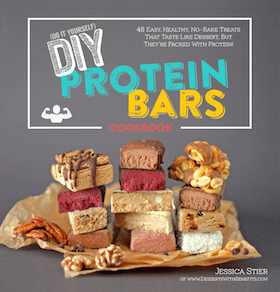 No bleached flour, no artificial flavors, no preservatives, and no hydrogenated oils. Sadly, those are all common ingredients in typical storebought crescent roll dough. I topped off the biscuit base with Homemade Caramel. No white sugar, no corn syrup, no heavy cream, and no butter (common ingredients in typical caramel). Make every day healthy dessert day and make a batch of these Homemade Twix Candy Bars! Afraid not… but I suppose you can try the crust from my Millionaire’s Shortbread Bars? This is a great idea. I’d probably have to switch the ingredients on the caramel. One of my kids has amazing radar for ingredients she doesn’t like, and coconut is way up there. I can’t even use a little bit of coconut oil for cooking without her catching me. what can be used in place of the sucanat? Can more erythritol? I am trying to make these for a diabetic friend and can not use the sucanat. OMG, I am SO happy these are vegan! Crescent roll mix in a Twix bar sounds interesting to me, but I think it would work so so well!